Editor’s note: This commentary is by Tony Redington, of Burlington, for the Pine Street Coalition LC3. He is a transportation policy development and research specialist. Turns out the Champlain Parkway goes back to court Aug. 8 with two opposition groups — the Pine Street Coalition and Burlington Fortieth LLC, which owns Innovation Center — appealing property takings by the city of Burlington over claiming lack of notification of some property owners and others affected. The grassroots Pine Street Coalition and Fortieth Burlington filed separate appeals. The Pine Street Coalition appeal follows its challenge a few weeks ago to the city, the Vermont Agency of Transportation, and the Federal Highway Administration to stop the shoddy project now because of changes in laws and policies since the 2009 now stale and invalid environmental document. The coalition backs its challenge with 240+ page documents set. The coalition seeks a cheaper, new generation approach that meets the business and community needs of the South End neighborhoods. The stated purpose of speeding cars between I-189 and downtown belongs to the car-centric 1960s, not the multi-modal world of today. The 2.3 mile project’s fatal flaws stem from laws, policies and new technology adopted since the last public hearing in 2006 and an environmental document filing in 2009. This decade, the South End emerged as the most exciting and vibrant area of Burlington, bursting with new development, generator spaces, eateries, a technology enclave, small businesses, an expanding artist and artisan neighborhood, and major anchor installations led by the City Market Co-op South End with 100+ jobs and Champlain College’s Miller Center education and cybersecurity venture with 70 jobs. The surge this decade in highway fatalities, led by pedestrians and bicyclists, compares to the absence of any safety consideration in the parkway, counter to the 2012 Vermont Complete Streets Law and federal statutes as well as several city plans since. The coalition predicts increased intersections injuries. Other major areas dismissed or ignored in the parkway runup: climate change emissions, impacts on the low income Maple-King street neighborhood, gasoline use, separate and safe pedestrian and bicycle travelways and encroachment on open space and the stressed Englesby Brook, and blocking transit terminal facilities access and routes. The two most obvious wasteful and hurtful parkway elements: two streets between Home and Flynn avenues instead of one quality and the severing of one of the only two north-south corridors in the South End by dead ending Pine Street short of Queen City Park Road, which forces South Enders onto Shelburne Road to travel to Hannaford, Lowe’s or the Palace theater. 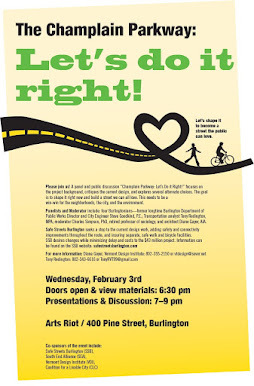 The Burlington Walk Bike Council in detailed letters to the city cited unsatisfactory walk and bike facilities and in 2016 endorsed the coalition’s parkway Redesign Guidelines. Yes, technology and best practices for street design changed radically this decade on busy streets which now include roundabout intersections (90 percent reduction in serious or fatal injuries – advocated by AARP, Geico, AAA, the Federal Highway Administration and VTrans draft development guidelines) and cycle track (protected bike lanes). Bicycles and pedestrians now require separate and safe travelways — a parkway defect easily remedied in a new design. The coalition calls for a cheaper (about $8 million cheaper), greener, quicker and (much) safer parkway design done through a democratic process. After four decades of studies and still invalid design, “let’s do it right the first time” by shaping a parkway the city can love!